Let’s talk about shoulder joint anatomy. As we briefly discussed on the introductory page, it is a ball and socket joint configuration. 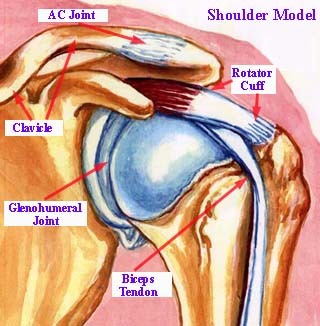 The humeral head is the “ball" and the glenoid is the “socket”. Other structures that serve to make up the “shoulder girdle” include the clavicle (collar bone), the acromion (top part of the scapula, or, shoulder blade) and the coracoid process (part of the front portion of the glenoid and an attachment point for ligaments). What sets the shoulder joint apart from other ball and socket joints, such as the hip, is mainly that the glenoid (socket) is rather shallow and does not, by itself, contribute too much to stability. It also relies upon the integrity of such structures as muscles, tendons and ligaments to maintain that stability and to keep it “in joint”. From behind, the muscles and tendon structures that make up the rotator cuff complex, namely the supraspinatus, infraspinatus, and teres tendons. You can also see how the combination of these muscles, tendons and ligaments work together to not only stabilize the joint, but to provide a wide range of functions and movements. The glenoid (socket) is, by nature, quite shallow, so a structure surrounds it, called the glenoid labrum, which acts to help “deepen” the socket to increase stability.